We decided that spring break would be the best time for our son to get his braces put on and boy are we thankful for that. I had no idea how uncomfortable the first week of wearing braces would be! Getting them on during spring break gave me some time to plan the lunches and snacks that he would eat once he went back to school. Everything I prepared had to be something he could eat quickly (he only has 25 minutes to eat at school) and nutrient dense with enough healthy fats to keep him satisfied if he couldn’t finish his lunch in time. 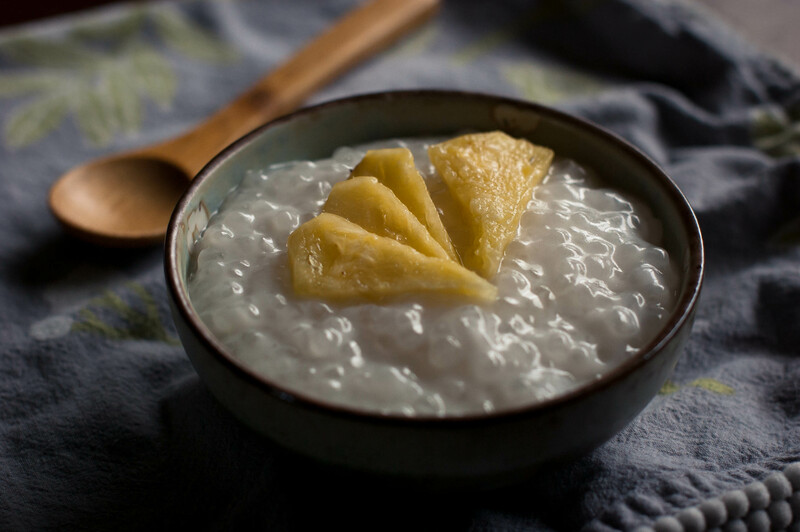 This coconut tapioca pudding has always been one of my son’s favorites and I made it as a treat to get him through his first week back at school. The original recipe calls for 3/4 cup of granulated sugar but I substituted with a small amount of honey instead. I find that the natural sweetness of the coconut milk and small amount of honey is enough to satisfy his sweet-tooth (and mine too). Put the tapioca in a bowl and pour warm water over to cover. Leave to soak for 1 hour. Drain using a fine mesh colander. Pour the measured water in a large pan and bring to a boil over medium heat. Add the honey and salt and stir until both are dissolved. Add the tapioca and coconut milk, reduce heat to low and simmer for 15 minutes or until the tapioca becomes transparent. Once the tapioca is finished, spoon into a bowl and enjoy warm with fresh fruit. You may also refrigerate the leftovers in a covered container.